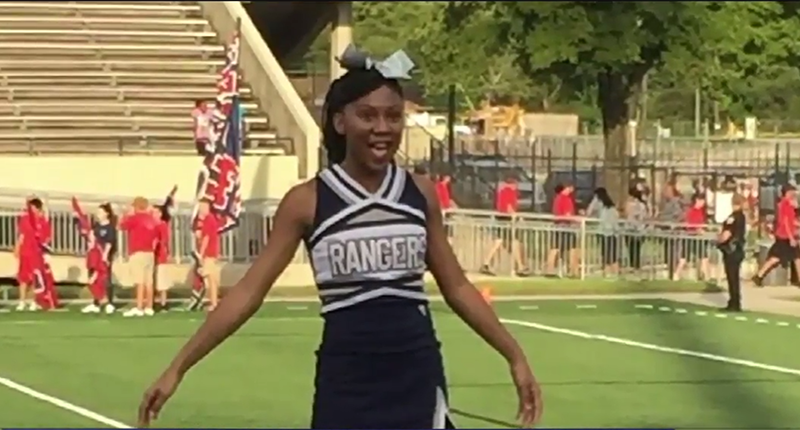 Kemirah Jn-Marie, 15, is a flyer on the Ross S. Sterling High School varsity cheerleading team and is a victim of discrimination by her coach with regards to her hair, according to an ABC report. She had braids done this year to meet cheerleading requirements that hair must be pulled back in a secure ponytail and must not distract from the cheer environment. According to Kemirah's mother, Mayra Jn-Marie, the coach told her daughter last week that if she showed up at Saturday's game with braids, she wouldn't participate. "The coach makes it hard to be on varsity," Kemirah told ABC. "She makes me feel bad about myself." Kemirah is the only African American on her team, and she and her mother say they believe the coach singles her out. "She's been harassed. She's been bullied by her teacher, and I'm tired of it," said her mother. The director of communications for the Goose Creek Consolidated Independent School District, Beth Dombrowa, issued a statement: "This student is not the only cheerleader who has been asked to correct her hairstyle, or other parts of her uniform; further, she was in no way reprimanded, punished or kept from participating—she was simply reminded to use the agreed-upon hairstyle. In no way do we discriminate, or tolerate, discrimination of any student."